I know, I know, this is extremely premature but I absolutely love both of these classics. I prefer hymns and ancient Christian chant over many of the new worship songs that frankly are little more than a bad imitation of rock music, and outdated rock music at best. The theology packed into those lines is intense. Original sin, being ransomed by Christ from the power of Satan, and all with a focus on the incarnation. Simply worded, but immensely deep. at http://anglicancontinuum.blogspot.com/2013/08/eleventh-sunday-after-trinity.html His most recent sermon is a very efficient explanation and defense of the Gospel against those who would rather minimize or ignore the cross (Modernism, Liberalism) or reject creation and pit the physical world against the heavenly (Gnosticism, certain parts of Evangelicalism). I highly recommend his blog, “The Continuum,” which follows the beliefs of traditional, orthodox Anglicanism in a confused world where it is easy to call oneself a Christian, much less Anglican, and end up with Cafeteria Religion. Unfortunately, contemporary American Christianity goes hand-in-hand with consumerism. 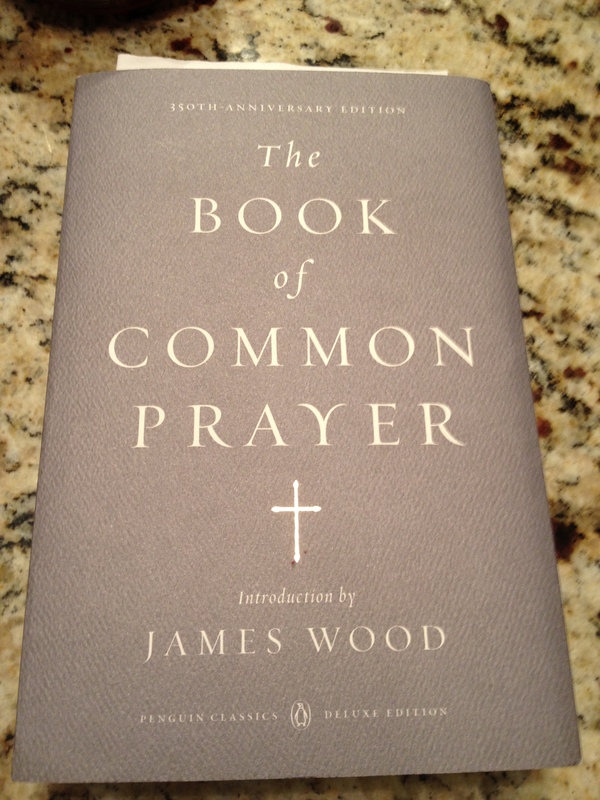 This 350th commemorative edition of the Book of Common Prayer (1662) is relatively fresh off the press from Penguin Classics. For those of you who may not know, the 1662 Book of Common Prayer (“BCP”), is the official BCP of the Church of England and is a masterpiece of English literature. This edition only comes in paperback with an excellent introduction from James Wood on how the BCP has impacted English-speaking peoples along with a brief, yet detailed history of the BCP. The nifty (I get paid per use of the word nifty) page holders can only do so much, due to the BCP being quite a thick lady (599 pages, no more and no less). Hence, you can see my super-expensive bookmarks (i.e. old church bulletin, sticky note, and Balderdash answer page – I kid you not). I’ll keep my day job and let my wife handle the photography next time. The font size is perfect and easy on the eyes. The editors did a great job spacing the text so it flows naturally and you aren’t distracted while doing the prayers. I apologize for the blurry image above. My wife is the talented photographer, and I promise never to venture into photography so whimsically as I have journeyed into the blogosphere. A thick little book; erasable pen leftover from middle school not included. 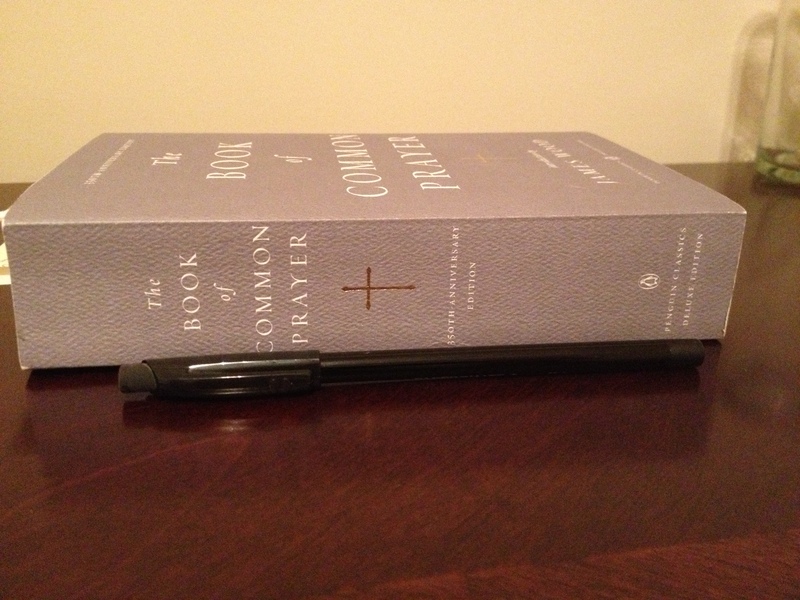 This edition of the BCP is great for toting around, and easily fits in one hand. But don’t expect to put this one in your pocket due to its hefty page count making it thick. Or you could be that guy and try hoisting around in your cargo pants. You will get strange looks. These pages are the bane of my existence. 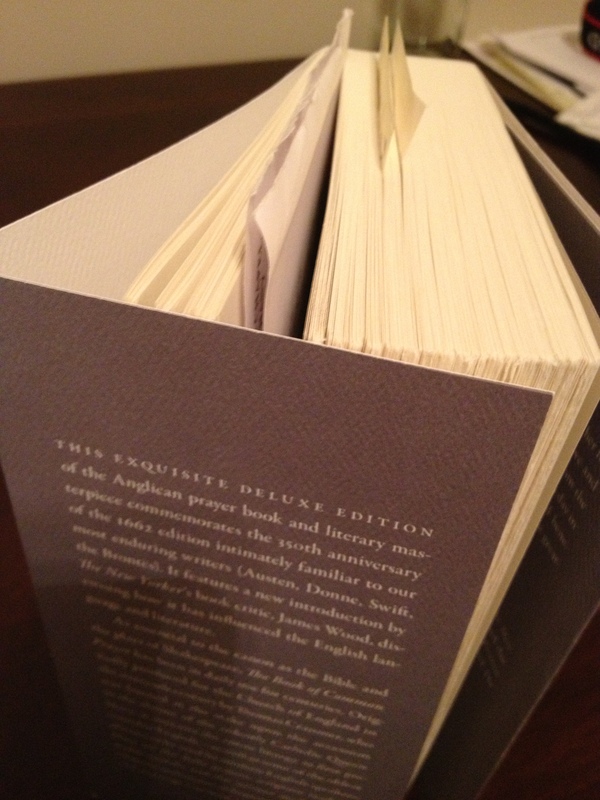 Penguin Classics went for the “old timey feel” for the pages and succeeded. But they failed in practicality. It’s nearly impossible to flip pages. 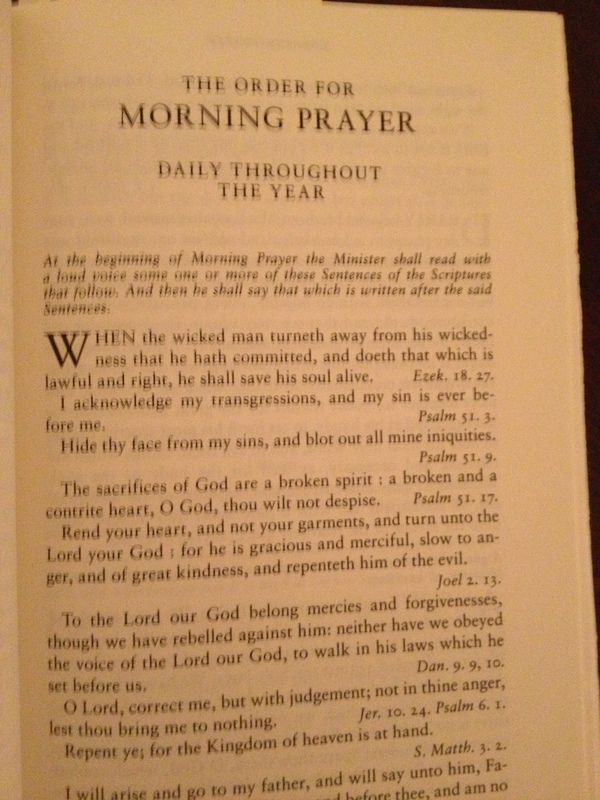 I can easily turn from one page to the next while going through Morning or Evening Prayer, but if I want to thumb through a stack of pages to get to The Litany or today’s Collect, good luck. Instead, you’ll awkwardly thumb from page 50 to 300. So you can see why I use my patented and charming bookmarks to mark those sections of Morning and Evening Prayer that regularly change. Honestly, this is the only bad mark I can give for this edition of the BCP, which is a minor complaint in my book. So why did I pick up this paperback if I intended to use it daily? Well, to be honest, the price tag is what ultimately attracted me at around $13-15 (list price of $20). 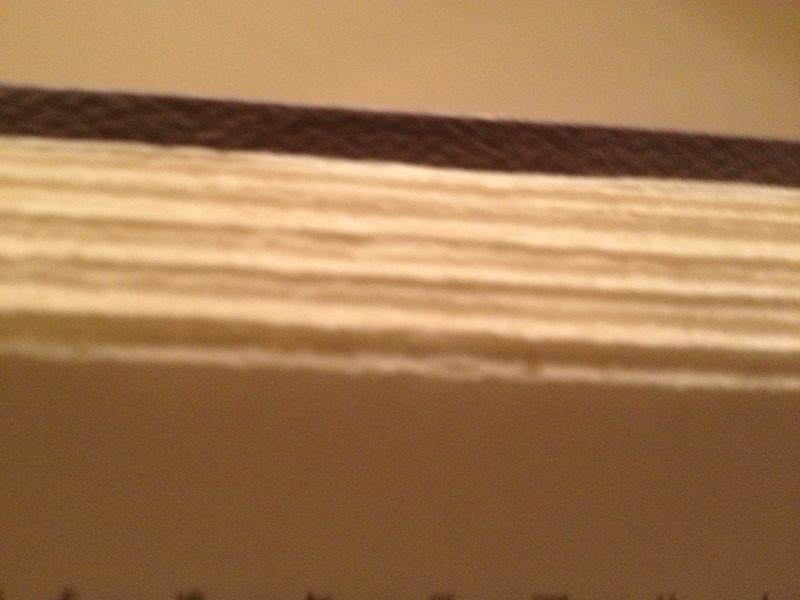 Even after half of year of near-daily use there isn’t too much wear and tear on it, except for an insignificant crease at the bottom of the book (see picture above). The binding is holding up surprisingly well and I love how durable it has been as I throw it in a car, toss it in my suitcase, etc. I love it for the purpose of being someone’s first BCP. The introduction by James Wood is great for Anglicans and non-Anglicans alike in being introduced to the liturgy of the Church of England. You may wonder, why pick up this over one of the American prayerbooks? Well the 1662 is still the official BCP for Church of England and the measure that all other Anglican Communion prayerbooks are [supposed] to be judged. I haven’t gone into details of what is inside the BCP because it is readily available online at http://www.eskimo.com/~lhowell/bcp1662/index.html. If you aren’t Anglican and wonder what all the fuss is about, this is a great place to find the full contents of the BCP. 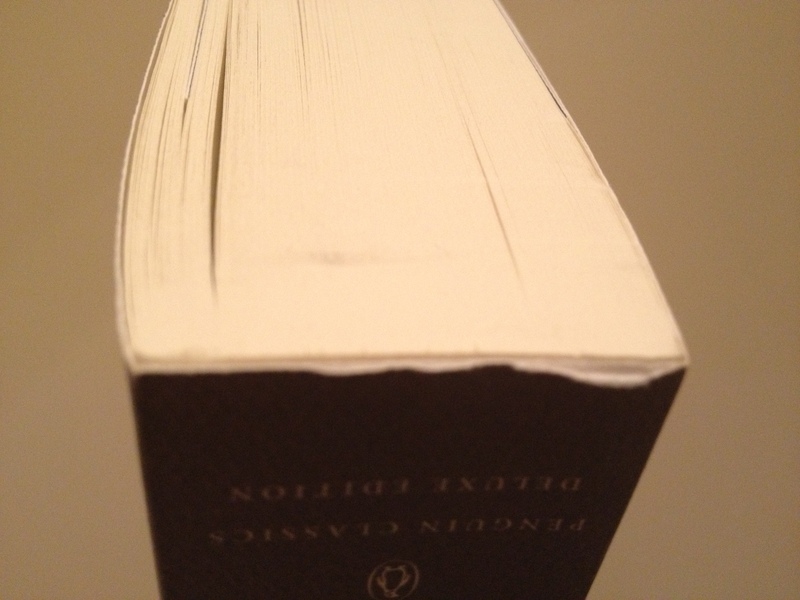 Overall, I give Penguin Classics a 4.5 out of 5 stars on this edition of the BCP.